On the highs and lows of Blizzard's nascent pro shooter. The last quarter of 2016 saw a whirlwind of professional Overwatch tournaments come and go. ESL, Overwatch Open, Apex Season 1, DreamHack Winter, MLG Las Vegas and other competitions put Overwatch on the map in the esports world. Of the major tournaments to be held in North America, the last was the NGE Winter Premiere, an event that saw its conclusion streamed live from PAX South in late January of this year. Immortals emerged victorious over Ghost Gaming in the Grand Finals, and continue to compete at the highest level to this day. I spoke with Noah Whinston, CEO of Immortals about the state of professional Overwatch as well as his team’s development. All we know with any certainty is that there aren’t many tournaments out there right now. Overwatch Contenders starts this weekend, Overwatch League begins sometime after that, and that Blizzard has plans for Overwatch and MLG. Whether or not it will be enough remains to be seen, but, as Whinston says, all of these other rumors are “rampant speculation”. As fans and consumers, we’d do well to just let things unfold instead of saying baseless things like “the scene is dead”. The implications that Overwatch League has for the esports industry are huge, and the game is still very young and developing. To that extent, Overwatch has also had its value as an esports title questioned by the community. Some feel that the game is too easy to hold the interest of its spectators, while others say that it’s far too complicated as a competitive title. “I think it’s a funny divide, because you have some people saying it’s too easy and simple a game, and some people think it’s too difficult and complicated a game, and I think that proves that the reality is somewhere in the middle" Whinston says. "From my perspective, Overwatch is a really fun game. It being a shorter game mode than League of Legends or Counter Strike isn’t inherently bad, because it has a ton of replay value." GrimReality and Agilities are two of the best players in Overwatch today, and if you happen to be among the people saying that Overwatch is too easy, go ahead and take a look at some of their replays or montages. The skill they exhibit under pressure is unparalleled. What’s even more impressive is that they play two of the most difficult characters to master in McCree and Genji. Now take into consideration that the Overwatch roster is constantly growing, and that the meta shifts with the wind. Overwatch is a very demanding game, and it will continue to get more challenging as characters and maps are added. Like other, proven esports titles, Overwatch is easy for the casual player to be of average skill, but difficult for most to reach the top echelons of play. 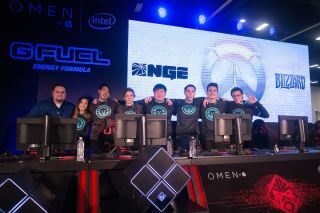 Indeed, the Immortals Overwatch squad is very young compared to Rogue, for example. “So what we found was Sodipop, which was a team that had some older players such as Hyped and Nomy, but it also had GrimReality and Agilities—I think Agilities was 16 at the time we picked him up and Grim was 17. We saw players that weren’t just incredibly talented right now, but were able to stay on top of the game going forward into the future, and that was especially what we were looking for. We weren’t looking for a team that would require tons and tons of rosters swaps to stay competitively viable.” Whinston says that the team is socially close outside of competition, which is sometimes hard to find in esports. Overwatch is still the new kid on the block when it comes to esports, and Blizzard has very ambitious plans for its award-winning FPS that has generated $1 billion in less than a year. Though there has been a lull in the action during this transitional phase, social media has been erupting with posts from individuals trying to field a team for Contenders this weekend. Furthermore, the Splyce roster was picked up by their former owners, Kungarna, Evil Geniuses put a team together in late April and the ex-Denial roster has flown solo under the Yikes! tag. Though some endemic teams may view the current lack of exposure as a hurdle, there is still a lot of growth and perseverance coming out of professional and amateur Overwatch. The ball is in Blizzard’s court.